Dave Chappelle, full name David Khari Webber Chappelle, is a famous American actor, stand-up comedian, producer, and writer. He is popular in the world for portraying his role in the comedy movie, Half Baked. Dave Chappelle was born as David Khari Webber Chappelle on August 24, 1973, and is currently 45 years old. 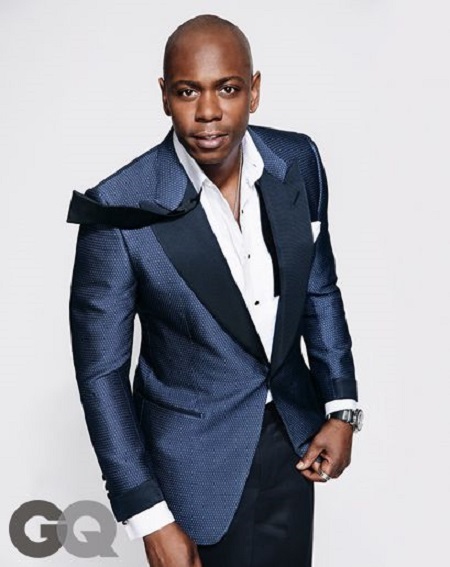 He was born in the upper-middle-class family in Washington, D.C., United States of America to father William David Chappelle III and mother Yvonne Chappelle. Both of his parents were highly educated people. Dave was raised in Silver Spring, Maryland and studied at Woodlin Elementary School. He completed his theatre' arts study from Duke Ellington School of the Arts in 1991. After his parents got separated, he lived with his mother in Washington while spending summers in Ohio with his father. Dave Chappelle is of American nationality and belongs to the black ethnicity. Dave Chappelle began his professional career as a comedian soon after graduating from Arts school. But he didn't have the best start as he was often booed for his early shows. But it gave the positive vibe inside him while leading him to be the successful man he is now. Dave began his professional comedy career in 1990 appearing in the first episode of ABC's America's Funniest People. Two years later, Dave Chappelle appeared in Def Comedy Jam broadcasted in HBO which helped him to grab huge attention being people' favorite new comedian in the town. He began his film career in 1993 appearing in the movie, Robin Hood: Men in Tights. Later, in 1995, Dave Chappelle began his television career appearing in Home Improvement. Till the date, Dave Chappelle has appeared in dozens of movies and television shows/ series like Undercover Blues, The Real Blonde, You've Got Mail, A Star Is Born, Blue Streak, Chappelle's Show, Saturday Night Live, The Larry Sanders Show, and many others. Talking about Dave Chappelle' personal life and current relationship status, he is a married man. After dating for a couple of years, Dave Chappelle married long-term girlfriend turned wife Elaine Mendoza Erfe in 2001. For now, it has been around seventeen years since Dave Chappelle and Elaine got married and is still living a healthy married life. There is no sign of them getting divorced. The couple welcomed three children; two sons and a daughter together. The family of five lives in their 65-acre farmhouse near Yellow Springs, Ohio. Dave Chappelle is also one of the richest black celebrities in America. He is definitely earning a great amount of money from his professional comedy and acting career. Dave Chappelle' net worth in 2015 was reported to be around $10 million, whereas his net worth in early 2019 hiked up and reached $42 million. Currently, Dave lives a lavish lifestyle living on a 65-acre farm near Yellow Springs, Ohio. He also owns several houses in Xenia, Ohio. Dave Chappelle was from the upper middle class family born as David Khari Webber Chappelle in Washington, D.C., United States of America to William David Chappelle III and Yvonne Chappelle. Both of his parents were highly educated person. He is an American and is black. Dave Chappelle has been honored with NAMIC Vision Awards twice in his life. He was first nominated in this award in 2004 and that was for Best Comedic Performance. He also won this award the following year from the same category. Primetime Emmy Awards is one of the prestigious awards in acting world and everyone feels really honored if they win this award. Dave Chappelle has been nominated in this award twice in this life but both times he was not able to win this. Dave Chappelle is a married man. He has been married with Elaine Mendoza Erfe from a long time ago and they are still together. They got married in 2001. They also have three children together. He is still with her and there is no any sign of them getting divorced. Dave Chappelle has changed his religion to Islam. In 1998, he changed his religion and in 2005 he reveled that he doesn’t want to talk more about his religion as it is secret. He also announced that he used marijuana heavily. Dave Chappelle received his formal education from Woodlin Elementary School. He showed the sign of comedian since his childhood days; he also used to make laugh to his parent’s friend when they came to their home. He was also enrolled at Duke Ellington School of the Arts. Dave Chappelle began his professional career as a comedian soon after graduating from Art school. But he didn't have best start as he was often booed for his early shows. But it gave the positive vibe inside him while lead him to be the successful man he is now. His comedian career lead him to pursue his career in the acting, while Dave Chappelle was giving some performance as a comedian he got a chance to meet several renowned actors too. He played his first acting role in 1993 and that was in Robin Hood: Men in Tights. Dave Chappelle' net worth in early 2019 hiked up and reached $42 million. Dave Chappelle' net worth in 2015 was reported to be around $10 million.